We are in full summer and August has been so hot here in California. A short and sweet post here for you all now that I finally got my hot little hands on this adorable Pinup Girl Clothing Jenny skirt in the Mary Blair ‘Circus Elephant’ print. Sweet, fun and whimsical!! 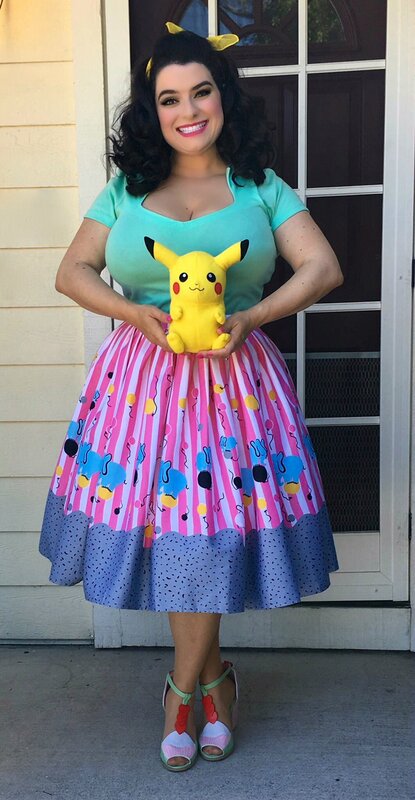 It matched my Pikachu too as Pokemon Go is so hot right now and we gotta catchem all. This one does not disappoint!! It is amongst my very favorite Jenny skirts from Pinup Girl. The print and colors are what this stunner is all about. This Jenny fits me spot on and I am wearing an XL, I did notice that the fabric does give a little in the waist making it just that much more comfy. I absolutely love the gathered waist and full hemline in this 1950s circle skirt. The Mary Blair magic is certainly there with the stripes that are so sweet and those charming Elephants and balloons in perfect big-top flair!! Colors of vibrant pinks, blues and yellows are what initially called out to me and I knew I had to have this skirt on my body right away. I paired it with my Steady Clothing Sophia top which is fits my curves perfectly!! I also added a pretty pink petticoat and Pinup Girl Clothing shows. Even my puppy dog Luna loved it… well maybe not as much as me!! Looking at the website they are nearly all sold out so don’t hesitate any longer and get the skirt while you still can, it even comes in the Lydia dress too! !